Home > Audio & Multimedia > Multimedia Creation Tools > Autorun MAX! ...... Simply add content such as photos, videos, music, and text to your pages and position them using your mouse. If you like, you can even use the included alignment tools, including grids and rulers to help keep things straight. We've even included lots of extra content like backgrounds, photos, panels, buttons, sound effects and more to get you started. Qweas is providing links to Autorun MAX! 2.1.2.0 as a courtesy, and makes no representations regarding Autorun MAX! or any other applications or any information related thereto. Any questions, complaints or claims regarding this application Autorun MAX! 2.1.2.0 must be directed to the appropriate software vendor. 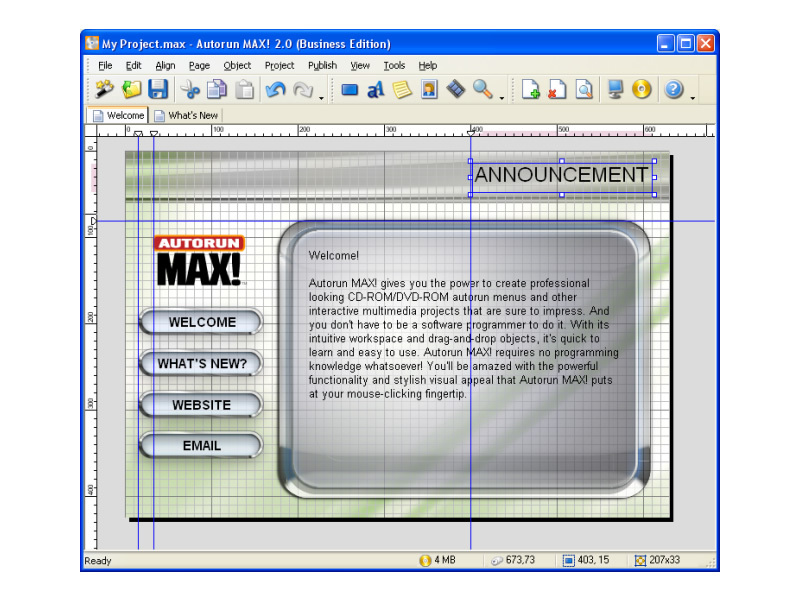 You may click the publisher link of Autorun MAX! on the top of this page to get more details about the vendor.